Lipnica, Poland, ca. 1930's. First row, left to right: unknown, Yosel Eizen (Pincus's cousin), unknown, Chaskel Kolender (Pincus's uncle, his father's brother). 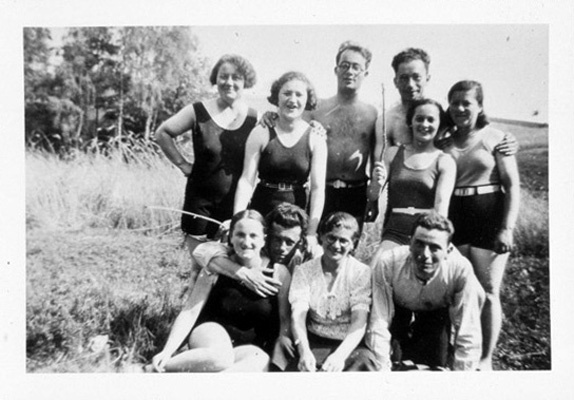 Second row, left to right: Rebecca Kolender (Pincus's aunt, his father's sister), next three are cousins with unknown names, Paerl Kolender (Pincus's aunt, his father's sister). Everyone in this photograph perished during the Holocaust except for Chaskel Kolender, who went to Russia and survived in Siberia.